CLUB TG is a community of incredible human beings who are daring to be themselves in creating their signature style. Creating their own incredible wardrobes filled with lovely garments they create, live and celebrate life in. We at TG hope to inspire you with unique design and technique with a comfortable and candid approach to sewing, making and living. 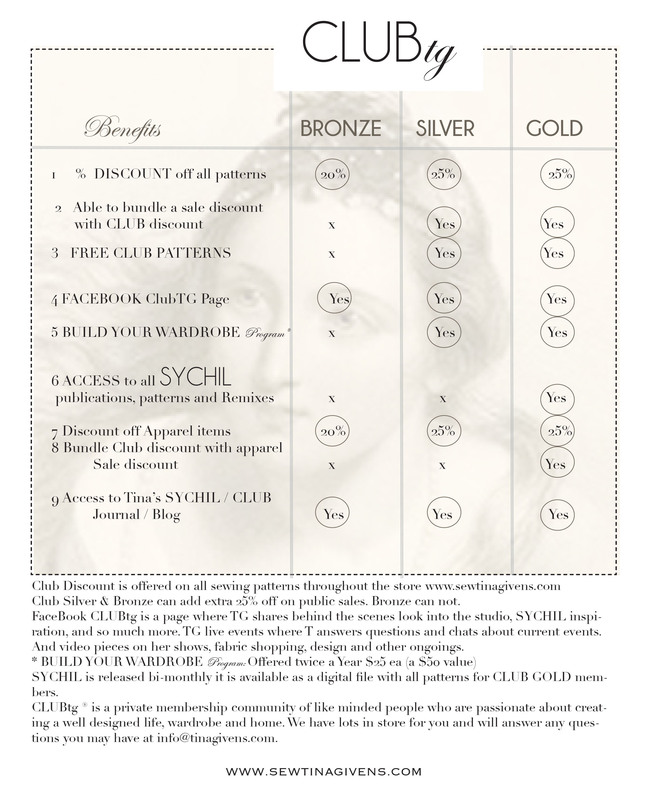 As a member, you will be rewarded with 20-25% discount levels, Free Sewing Patterns each month, and download a pattern each month free for being a Silver or Gold Member. With over 100 garments to choose from, we think you will find something you have been looking for. We want to offer you insight, creative technique and ideas to inject your signature into each piece you make. We have a new FaceBook Group to inspire and share along the way with personal live effects with Tina Givens, to talk through some of the new projects, fabric and palettes, and the new DESIGN YOUR SEASONAL WARDROBE Program launching in Spring. ** Note These are also offered to the Public, at the regular rates. First one is February 1st at 2pm... Will you be there?